GDPR is a significant change in data protection regulation in the EU and replaces the existing legal framework (the Data Protection Directive and the various member state laws). It will come into effect on May 25, 2018. Email subscribers is fully committed to achieving and upholding ongoing compliance with GDPR prior to the effective date. To ensure that the subscription form provided within Email subscribers is compliant to GDPR, we have provided a ‘consent seeking’ checkbox in each of our forms. This article explains how to enable consent checkbox in the subscription form provided by Email subscribers. NOTE: It is mandatory to download and add the GDPR plugin by Trew Knowledge inorder to make Email Subscribers GDPR compliant. 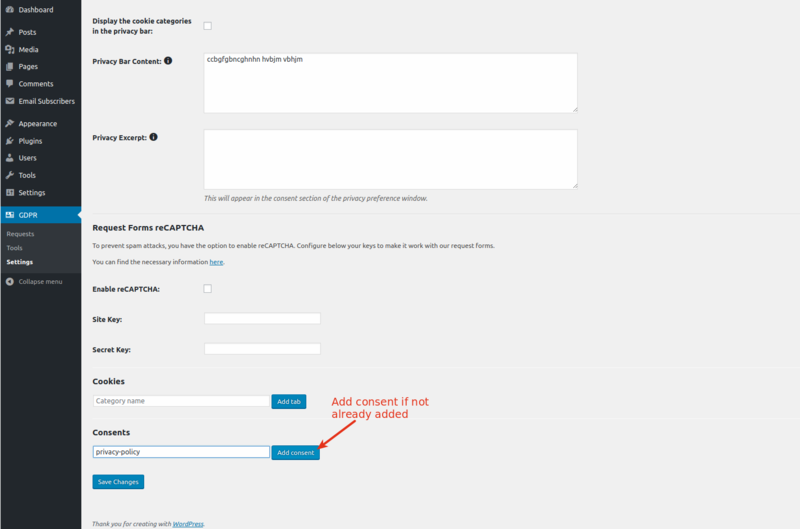 How to enable consent checkbox in the subscription form? Make sure you have installed and activated above mentioned both plugins (as it is necessary for the consent checkbox). This is the consent checkbox that will be shown in Email Subscribers form. Note: Consent id should always be privacy-policy. Note: This article does not constitute legal advice. We recommend consulting with professional legal counsel to make sure you’re compliant with all GDPR regulations.